Send in your questions for the show. Dr. 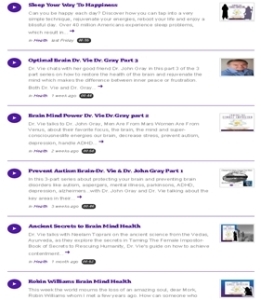 Vie with Dr. John Gray, Part 2 of 3 on Mind Power. Click here for the replay of Part 1. Dr. Vie with Dr. Gray Part 1. To access the prime content on our previous Shows and Events we encourage you to become a Free Subscriber, get instant notifications and take advantage of special VIP invites to events. Click Below and Follow us on Social Media to get live broadcasts and links to Archived Shows. Dr. 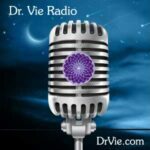 Vie is a guest on the Noll Show and chats in detail about Inner Peace To World Peace. Dr. Vie interviews Chris, a member of Dr. Vie Academy. Chris lives a healthy lifestyle and he shares his input about the Academy. He describes how his sleep and general well being have improved through techniques learned during the Dr. Vie Academy seminars. Listen to this interesting candid interview of Dr. Vie Academy benefits health and how meditation helps Chris with his sleep apnea. Dr Vie’s London Olympic cyclist, Laura Brown suffered a concussion at the Exergy USA road cycling race just weeks before the Olympic trials. She had just completed the Dr. Vie Academy Seminar 1 on the Brain. Hear how she recovered from her brain injury and made it to the Olympics. Dr. Vie’s Canadian women athletes prepare for London Olympics 2012. Janet Jacks health food specialist from Hamilton and AM900 CHML Saturday Radio Talk Show Host interviews Dr. Vie before Dr. Vie’s mountain trail run in Quebec. Learn about how to prevent illness through powerful foods. Click the link to listen now. August 2011 Dr. Vie interviews Sensei Susan Baldassi, 5th Dan black belt & highest ranked martial arts instructor in Canada. Sensei Baldassi discusses physical, mental and emotional power of martial arts. This interesting interview provides information on fitness for famillies, women and children. Sensei Baldassi is based out of Thunder Bay Ontario the Capital of Martial Arts in Canada. She has recently launched her series of publications Chi 4 Energy. Dr. Vie interviews her first athlete Alison Testroete at the Los Angeles airport as she heads back to Holland. Alison is one of Canada’s top road cyclists (champion 2009), survived a severe road crash in Italy in 2010. Recovered from intense facial surgery and now rides with Skil Koga. Alison will compete in the 2012 London Olympics. Dr. Vie interviews Erinne Willock, Canadian pro cyclist on Team Canada and on Team Tibco Dr. Vie Superfoods. She is based out of Victoria, BC. Erinne raced at the CommonWealth Games in India in 2010 and has many wins under her belt. Hear her tips for youngsters before she heads out for Team Canada training camp in Los Angeles. Dr. Vie interviews her athlete Tara Whitten after her Gold medal win at the World Cup Track cycling event on 22 January 2011. This amazing woman, winner of Presidents Award for 2010, a Ph.D. student and world track champion is a role model for young and old. Dr. Vie interviews Sarah Ingelton, Toronto Life Saver born in Jamaica, Coach and Official at Rescue 2010 before the Championships in Egypt. Sarah is active on the Ontario public education program for children. Dr. Vie chats with Robin Farina a woman professional road cyclist from Charlotte, NC, USA. Robin also a bike store owner of Uptown Cycles and trainer provides insights into natural health and fitness. Dr. Vie talks with Lisa Hunt in Chicago, Director of Team Vera Bradley, Womens Professional Cycling Team in the USA (ranked #2 in USA) during 2010. Dr Vie Athlete Laura Brown in Los Angeles, Canadian Team Pursuit Champion 2010 shares her passion on how to make a difference? Laura just returned from World Cups in Melbourne and Columbia and is preparing for the next World Cup in China. Laura is one of the three cyclists featured on our website picture. According to Laura”her goal is to optimize her human potential and share it with the world”. Dr Vie Alison Testroete Italy Canadian Road Cycling champion 2009 and 3rd in 2010. The interview was before her horrific crash in Luca, which took her out of the Commonwealth games in India. She is now well recovered and has joined a Dutch Team in Holland for 2011. Dr Vie athlete Matt Baker Mixed Martial Arts Fighter before his comeback King of Cage fight after recuperating from a severe injury from his last fight. Vie Radio Talk Show in Singapore in memory of Marc Becker a legend – The Method was created by Iron Guides founder Marc Becker. Forget the gadgets in training, instead the Method focuses on hormonal balance. Revolutionary and result driven. Dr Vie chats with Boris Verkhovsky Cirque du Soleil Performance Director on his secret to baby boomer health during the birthday bash for Cirque du Soleil. Dr. Vie introduces Matt Baker, a dashing young mixed martial arts fighter from BC. Learn about mixed martial arts, jiu jitsu and the amazing story of this foster child who beat all the odds. Matt donates his monies to foster children and helps kids lead happier lives. Listen and love the heart of this young man. Dr Vie Heidi Hollinger host of TV5 globe trotting show and well known photographer of famous personalities, including Premier Jean Charest, shares her secret to looking gorgeous – from the airport en route to Finland. I've inspired tens of thousands of all ages from 3 year olds to 100+ because it's our role to spread love. You too can be the one to bring love and hope to our fellow humans, just when they need it. Invite Dr. Vie to INSPIRE YOUR GROUP and spread the love. Everyone needs inspiration, even the richest man and wealthiest woman. Non-religious, neutral, embracing all humans no matter what. Patients, children, students, lecturers, CEO's, staff, doctors...benefit. Anyone who understands English, anywhere in the world benefits.